Walter Horace Carter (January 20, 1921 – September 16, 2009) was an American newspaper publisher in Tabor City, North Carolina, whose paper won a 1953 Pulitzer Prize for his reporting on the activities of the Ku Klux Klan and his editorials opposing it. 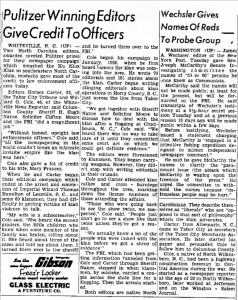 After witnessing a Ku Klux Klan motorcade drive through Tabor City, North Carolina in July 1950, Carter began writing Klan-related editorials and reports for the Tabor City Tribune. His work on the subject spanned more than three years and totaled nearly 130 items. Carter was born and raised in Stanly County, North Carolina, during the 1920s and 1930s. He was born in a small house owned by the Efird Cotton Mill on the corner of Church and Mill streets in Albemarle, North Carolina. Both of his parents worked at the mill, where he later worked as well. My Daddy was a machinist; my mother worked in a cotton mill. But from the time I was eighth and nineth grade in high school I was interested in the newspaper business. I had an English teacher who I think had a lot to do with this, and I had written sports for the little newspaper in our county, the Stanley News and Press, while I was in school. This got me interested in it. And I knew that’s what I was going to do when I went to Chapel Hill. You might also be interested that while I was there (well, he’s dead now) Bob Madry, who was the director of the University News Bureau, was good enough to give me a job in the News Bureau when I was a freshman at Chapel Hill. I worked there the whole four years, and I’ve often said that I believe I learned as much from Bob Madry as I did going to school at Chapel Hill. His schooling was interrupted by service in the U.S. Navy during World War II, but he completed his degree in journalism in 1949, by which time he was already editing and publishing the Tabor City Tribune. In 1947, Carter became the secretary of the Tabor City Merchant’s Association and moved to Tabor City, North Carolina, with his young family. Following a brief sojourn in Chapel Hill, where he helped establish the Colonial Press (which printed the UNC newspaper The Daily Tar Heel), Carter officially settled in Tabor City, becoming publisher and editor of the newly-created Tabor City Tribune. Shortly after the weekly newspaper debuted, the Ku Klux Klan began a virulent recruitment campaign in Columbus County, North Carolina, and in surrounding areas along the North Carolina-South Carolina border. The interview with Carter focuses almost exclusively on the actions of the Klan from 1950 to 1952—when members of the Klan were convicted for flogging numerous people—and on Carter’s journalistic campaign against their efforts. Carter describes in detail how the Klan campaign began during the summer of 1950 when they brought a motorcade through Tabor City with the intention of recruiting new members and intimidating African American neighborhoods. That summer, Grand Dragon Thomas L. Hamilton gave speeches around the area to recruit members and to outline the goals of the Klan. Carter stresses that the Klan during those years was not only outspoken in its opposition to African Americans, but that they also opposed Jews and Catholics, liberals such as Frank Porter Graham, and the newly formed United Nations. Carter explains that many people found various aspects of the Klan’s message—including its anticommunist stance—appealing. 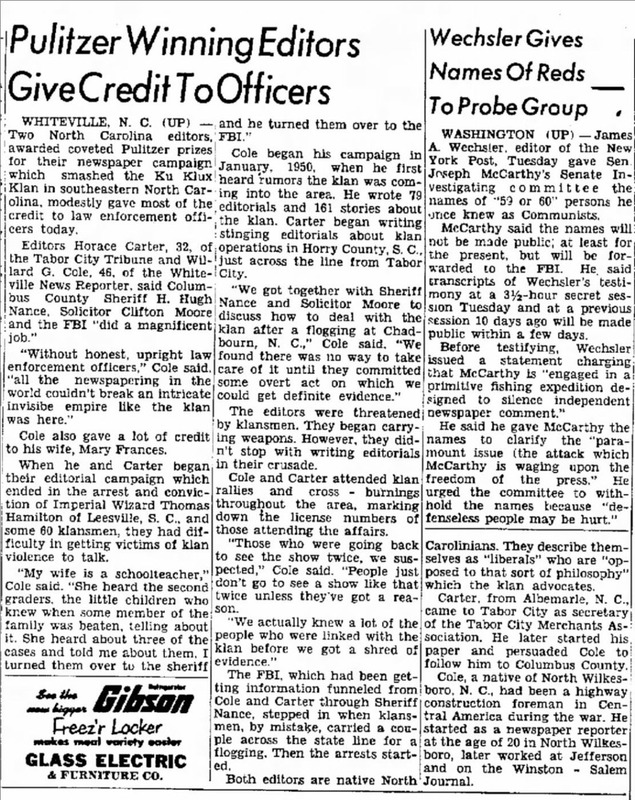 In response to the Klan’s vigilante tactics, Carter publicly attacked the Klan in weekly columns for the Tabor City Tribune and worked closely with others fighting the Klan, including Columbus County Sheriff H. Hugh Nance, fellow newspaper editor Willard Cole of the Whiteville, North Carolina, News Reporter, and agents of the Federal Bureau of Investigation (FBI) and the State Bureau of Investigation (SBI). Carter also spends considerable time enumerating the nature of threats, both economic and physical, he received from the Klan, his interactions with Klan leaders such as Grand Dragon Hamilton and Early Brooks, and connections between the Klan and local law enforcement, such as Horry County, South Carolina, Sheriff Ernest Sasser. In 1953, Carter and Cole were both awarded the Pulitzer Prize for their role in bringing to justice Klan members guilty of flogging. The interview concludes with Carter offering his thoughts on various social issues confronting the nation at the time of the interview in 1976, touching on such topics as school integration and busing, economic problems, the Equal Rights Amendment, and patriotism. Despite receiving death threats against himself and his family, Carter used the editorial authority of the Tribune to protest the Klan’s racist rhetoric and vigilantism. Carter’s bold reporting and the unwavering integrity of his editorials helped lead to the first federal intervention in the South during that era, and to the arrest and conviction of nearly 100 klansmen. 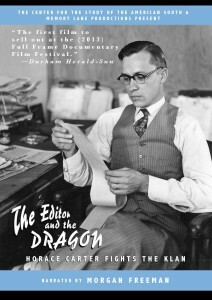 Watch the one-hour PBS documentary The Editor and the Dragon. Click here to view several selections from Carter’s work for the Tabor City Tribune, including a front page exchange between Carter and Klan Grand Dragon Thomas Hamilton. Additional sources are housed in the Southern Historical Collection at UNC-CH. Click here for Educational Materials from UNC. Teachers may obtain free copies of The Editor and the Dragon for classroom use by emailing csas@unc.edu. View photos of Carter and read more about his life here. Carter’s obituary in The New York Times. Books written or edited by Carter.